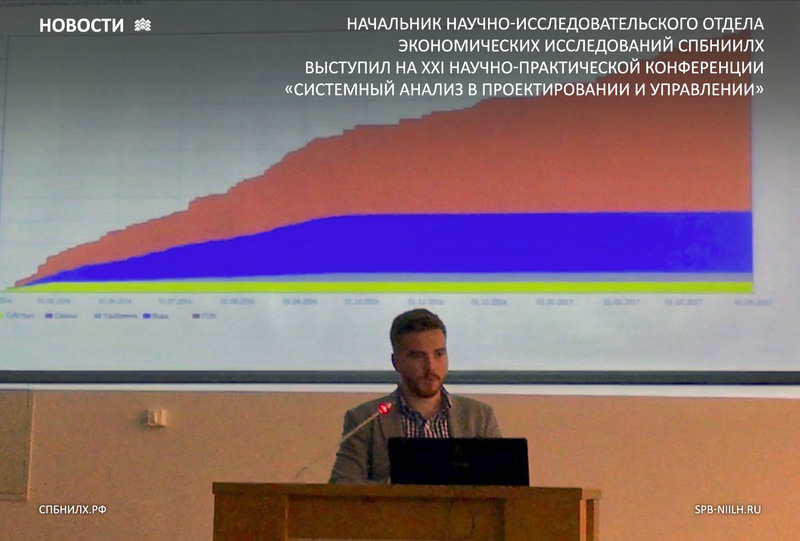 Head of the Research Department of Economic Studies of SPbFRI has make a presentation at the XXI Scientific-Practical Conference "System Analysis in Design and Management"
On June 29 - 30, 2017, the SPbFRI director, candidate of economic sciences Igor Anatolyevich Vasilyev and head of the Research Department of Economic Studies, candidate of economic sciences Oleg Igorevich Vasilyev participated in the XXI Scientific-Practical Conference "System Analysis in Design and Management". The event was held at the St. Petersburg Polytechnic University of Peter the Great. O. I. Vasilyev made a presentation on the topic "Analysis of resource consumption in the system of serial production of standard planting material based on simulation". The scientific leader of the SPbSPU, Academician of the Russian Academy of Sciences, Doctor of Technical Sciences, Professor Yuri Sergeyevich Vasilyev made a welcoming speech at the opening of the conference. The conference program dealt with the general theoretical problems of system analysis, system analysis in design and education, management of enterprises and organizations, quality management.